I always looking forward to creating a Rathsallagh House wedding video. I had previously met Sinead and Dan a couple of times and was immediately struck by their warmth and affection for each other. With their wedding date set for late Autumn, I was worried that the light and weather might not play ball. But it did! 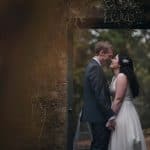 The light was something special and their wedding photographer Claire (Ginger Pixel Photography) was sharing my delight. A Rathsallagh House wedding looks well no matter what the season. However, there’s just something special about an autumnal wedding in the Wicklow countryside. Rathsallagh is in an amazing setting of large trees and wooded land that bask glowingly in the autumn light. I feel truly blessed to be a wedding videographer in Wicklow when all of this beautiful scenery is on my doorstep. Hope you enjoy this coming soon teaser film from their Rathsallagh House Wedding Video!